Children's education and health are among the top three causes consumers in Singapore would support, a study has found. Helping those with serious illnesses, and poverty and starvation alleviation are the other top two causes, the MasterCard Ethical Spending and Charitable Giving Survey found. In revealing the findings yesterday, MasterCard, which conducted the survey, said that 24.4 per cent of respondents in Singapore indicated support for children's education and health. This was lower than the 37.8 per cent of respondents in the Asia-Pacific region. It was also a drop from the 27.2 per cent in 2015. Mr Gerard Ee, 68, chairman of the Charities Council, said: "The sector concerning children has always been popular. Even in the retail industry, the children's sector has always been strong. "Most Singaporeans would come from small families and invest a lot into children, hence having a natural affinity to children's causes is understandable." Most Singaporeans would come from small families and invest a lot into children, hence having a natural affinity to children's causes is understandable. MR GERARD EE, chairman of the Charities Council, on why there is strong support for child-related causes. Support for those with serious illnesses stood at 22.5 per cent among Singapore respondents, the same figure for support for poverty and starvation alleviation. The survey presented seven causes, and respondents had to rank them from one to seven, with one being the lowest score and seven the highest. The Singapore survey polled a total of 500 respondents aged 18 to 64. 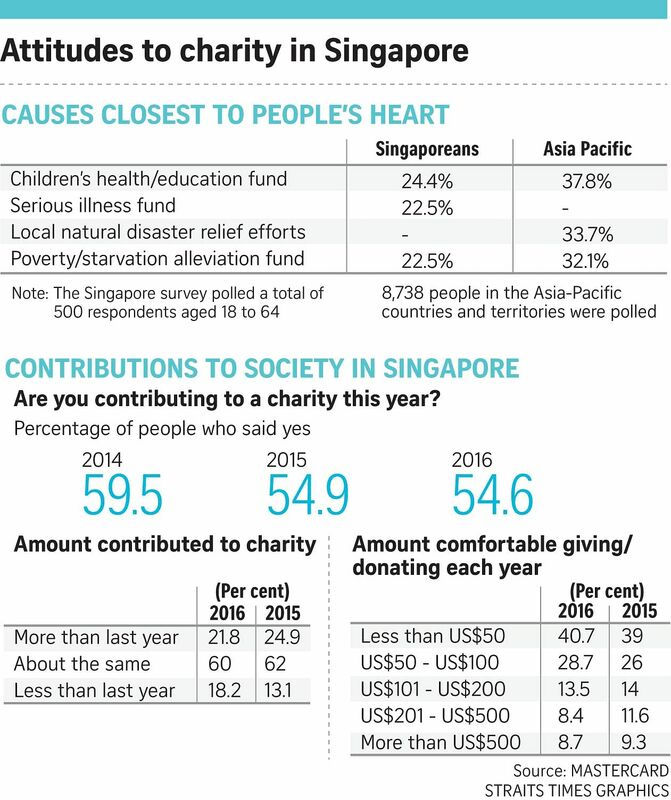 Among other results, the survey, which was conducted online last November, also found a dip in the number of Singapore respondents donating to charity. In 2014, 59.5 per cent answered "yes" when asked if they had contributed to charity. This fell to 54.9 per cent in 2015 and 54.6 per cent last year. Last year's figure, however, is still higher than the 50.4 per cent for the Asia-Pacific average. Mr Ee commented: "There is no surprise there. How generously donations were made was very much in tune with the economy. The economy has not been well in the past few years; donations naturally would go down." Out of the 54.6 per cent of Singapore respondents who donated to charity last year, most (40.7 per cent) donated less than US$50 (S$68), while 28.7 per cent donated US$50 to US$100. Another 8.7 per cent donated more than US$500. Less than half of the Singapore respondents also bought items because a percentage was going to be donated to a good cause. Only 33.3 per cent of Singapore respondents placed that as their reason, compared with the Asia-Pacific average of 44.4 per cent. "As a population, we are naturally calculative and many of us are constantly on a hunt for good bargains. We prioritise ourselves and this culture is very much reflected in the way we buy things," Mr Ee remarked.